Teams get ready for the semi-finals. Mulling over answers in the elimination round. 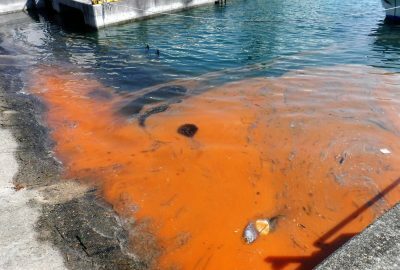 The qualifying round took place at the Asian Dive Expo (ADEX) in April this year, and – in keeping with the focus of the event – tested participants on their knowledge of climate change with 25 multiple choice questions. 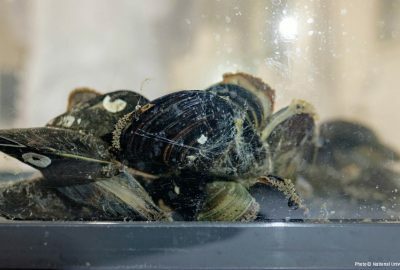 Testing the buzzer in the semi-finals. 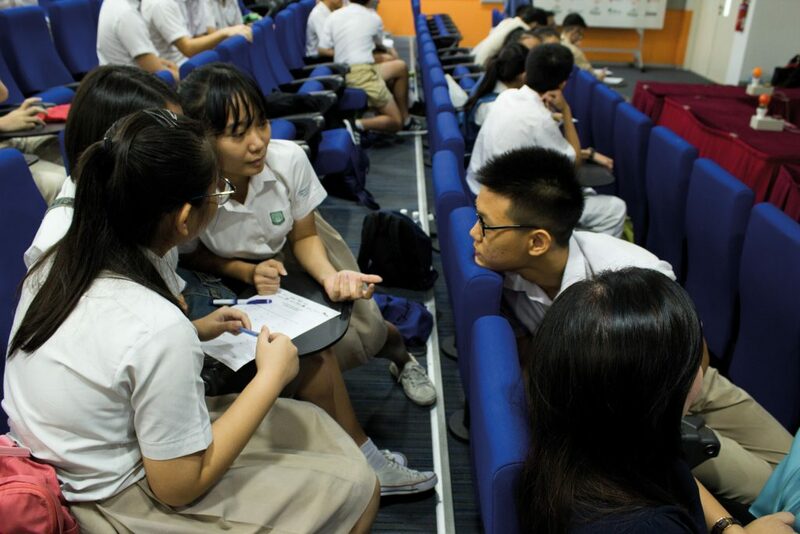 Fast-forward to July 8, and the teams put their thinking caps back on for the elimination round – another 25 multiple-choice questions on geography, history, conservation and current affairs in Asia. 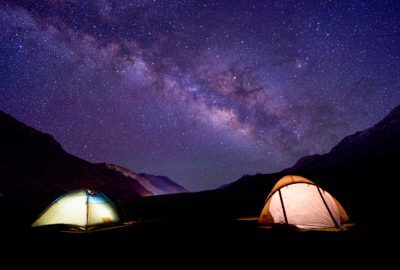 All questions were derived from the past two years’ issues of Asian Geographic magazine, and so the more vigilant and diligent students gained an edge in the competition by reading up beforehand. Guest speaker Dr Toh Tai Chong. 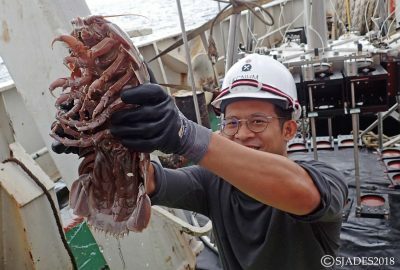 We were then joined by Dr Toh Tai Chong, a lecturer and research fellow at the Tropical Marine Science Institute at NUS, who gave an engaging talk on the crisis of marine trash, and how we can all do our part to clean up our oceans, with several students putting questions to Dr Toh after the presentation. Tension was high as the names of the first four teams were announced, making it into the semi-finals. 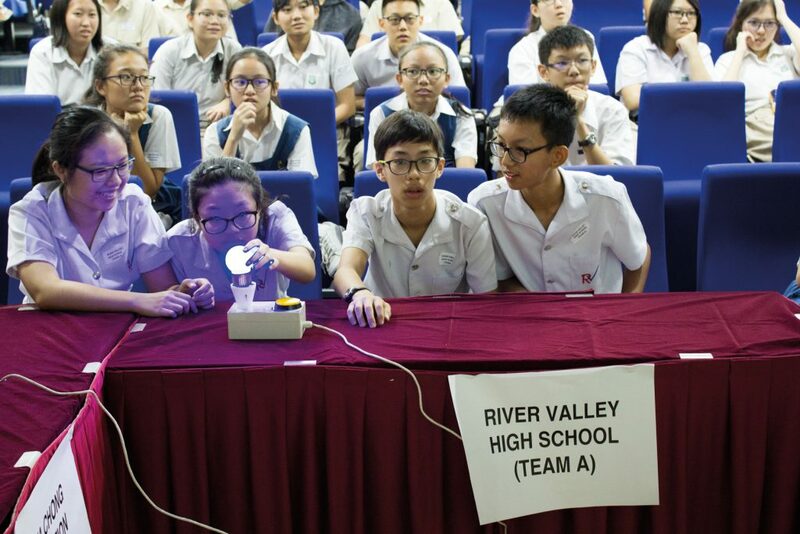 A team from Hwa Chong Institution emerged victorious in this round, as did another two teams from this school in the two subsequent rounds, placing three teams from Hwa Chong Institution neck-and-neck in the finals. 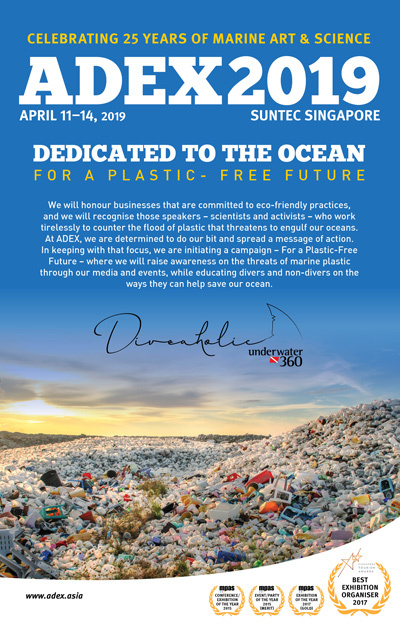 Guest speaker Khong Swee Lin. 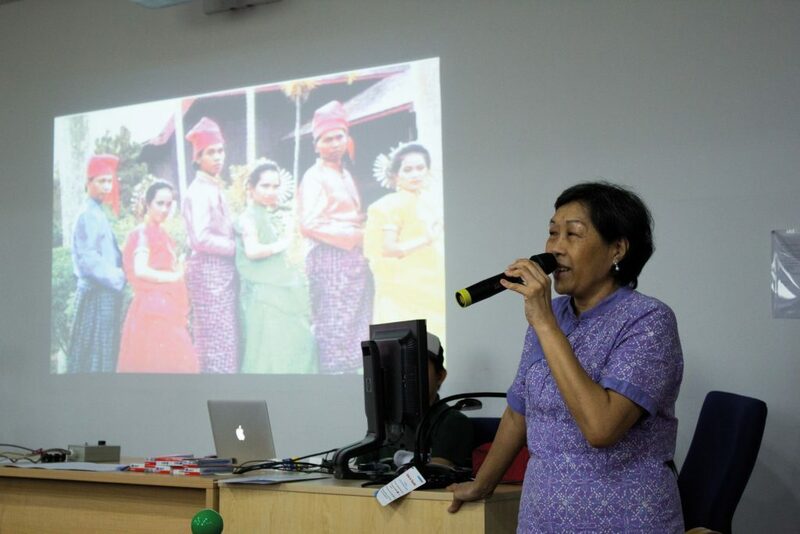 Participants had the opportunity to take a breather from all the action, however, with a delicious bento box lunch sponsored by Makan Mate, and another two talks from our guest speakers: Ms Khong Swee Lin – a trainee docent at the National Gallery Singapore – who spoke about the Buginese, and actress Ms Debra Teng, a marine ambassador for Shark Guardian. 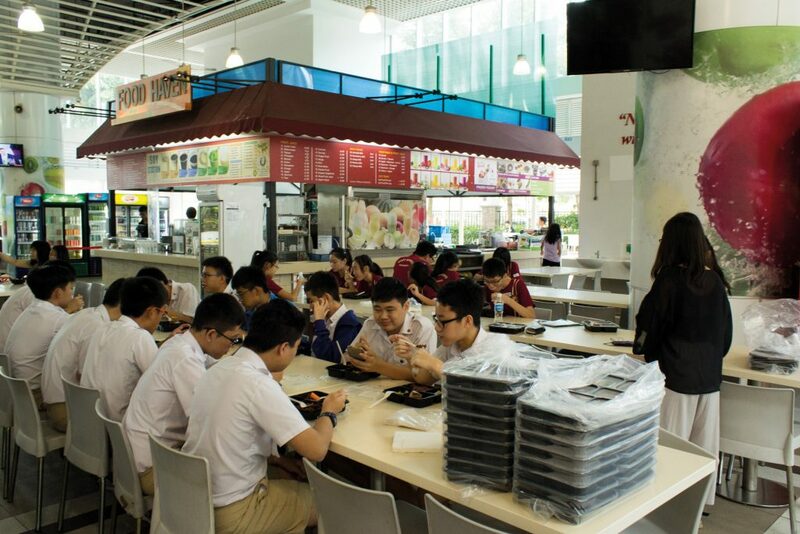 Team enjoy a complimentary lunch from Makan Mate. 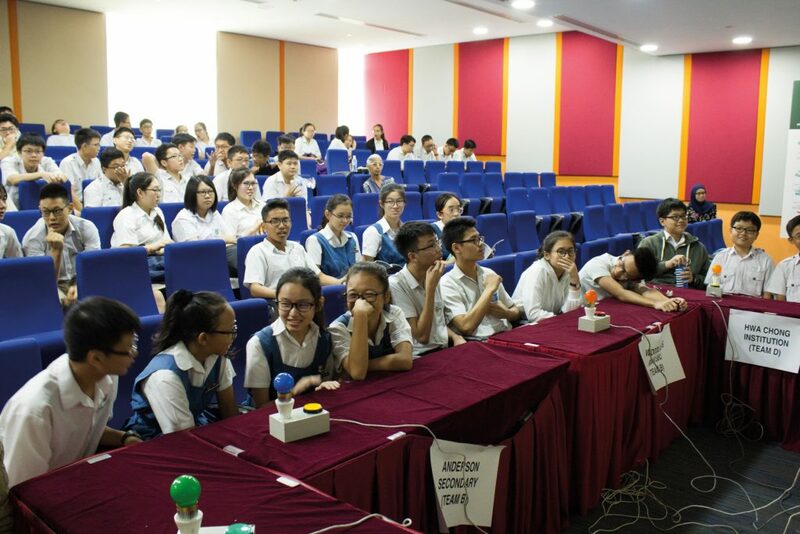 The finals were upon us with the three leading teams from Hwa Chong Institution taking to their buzzers, answering 10 picture-related questions. 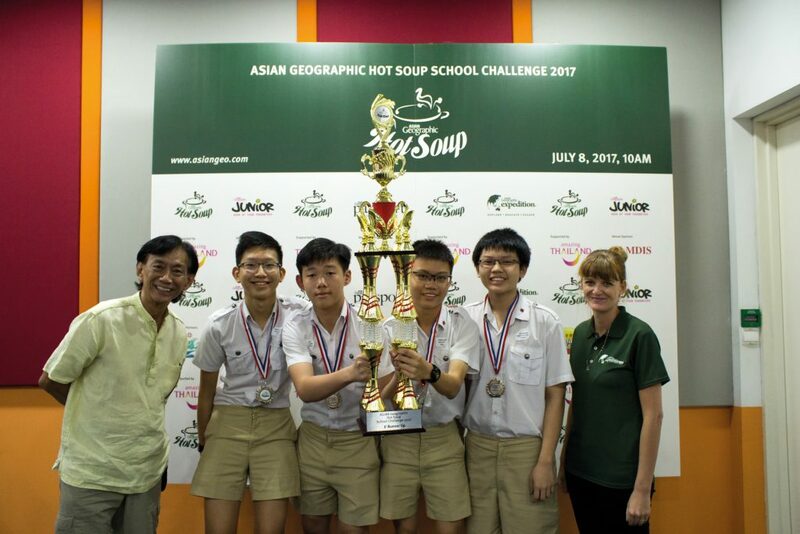 Team E emerged victorious as the ASIAN Geographic Hot Soup School Challenge 2017 Champions, walking away with the grand prize: a four-day, three-night educational and cultural trip to Bangkok, Thailand, sponsored by the Tourism Authority of Thailand (TAT). 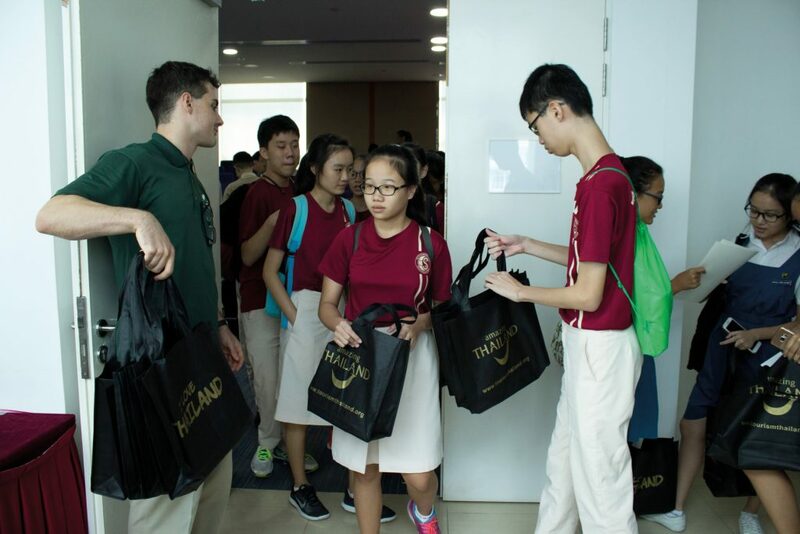 Participants receive their goodie bags. 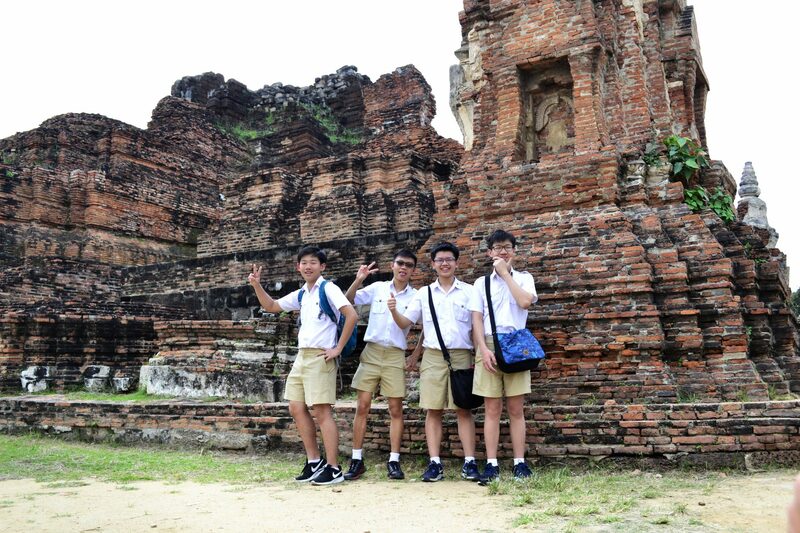 The trip will take the students to the floating market, Dinosaur Planet, a family-owned eco-village, and to Ayutthaya, the second capital of the Siamese Kingdom. 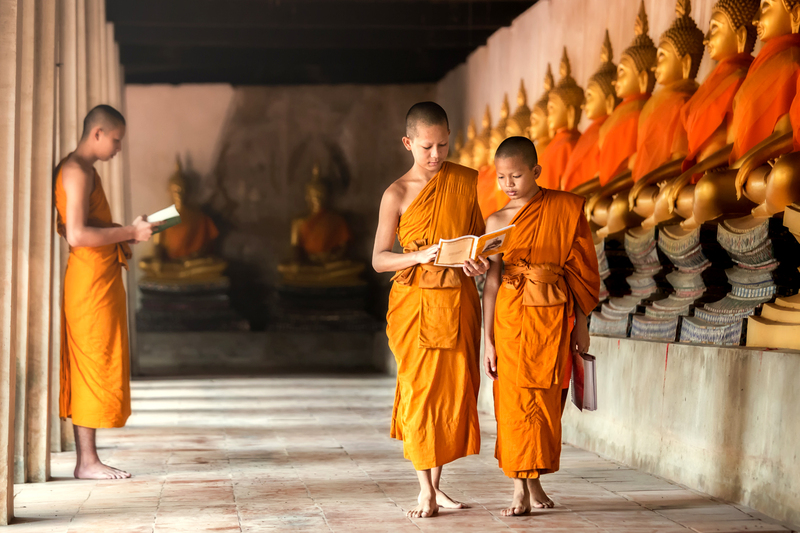 They will also be able to participate in a cooking class, and attend a Muay Thai training session. 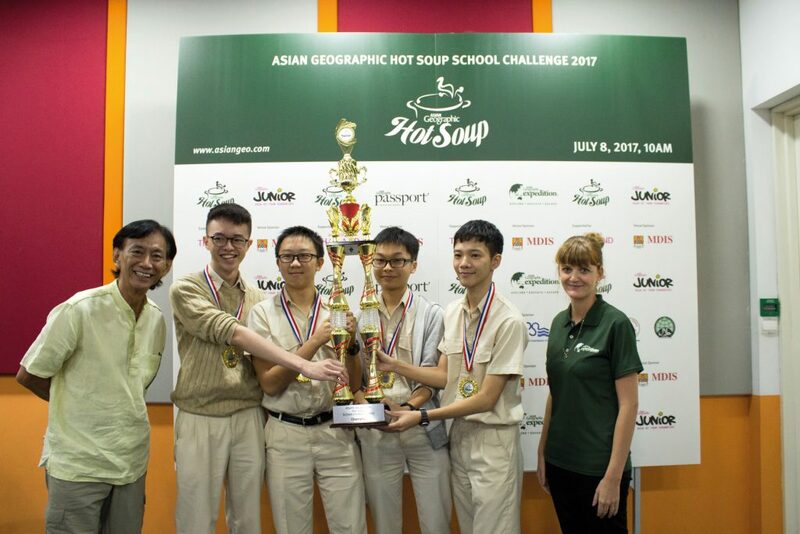 The Hot Soup School Challenge champions from, Hwa Chong Institution Team E: Alvern Mak, Cleon Yong, Ernest Ng, Ho Choong Kai. The winning team – Alvern Mak Wei Jie, Cleon Yong Tzen Wen, Ernest Ng Wei Jun and Ho Choong Kai, spurred on by their teacher Ms Li Young Chua-Ngui – were all smiles and fist pumps as they claimed their enormous gold trophy and medals. In the spirit of the competition, the first and second runner-up teams gave the champions their hearty congratulations and applause. 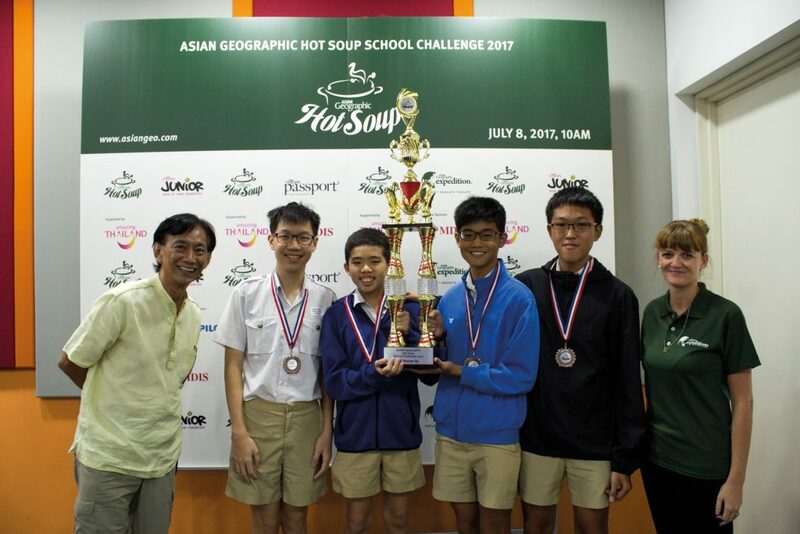 The Hot Soup School Challenge first runners-up, Hwa Chong Institution Team C: Elijah Choo, Chan Kai En, Tan Teong Seng, Yong Khee Hou. 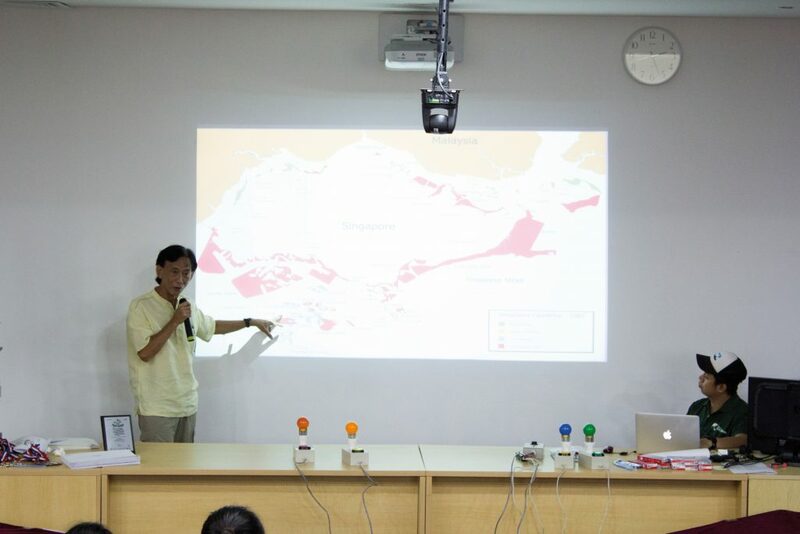 We were honoured to have the Vice-President of the Singapore Nature Society, Mr Leong Kwok Peng, grace the event. 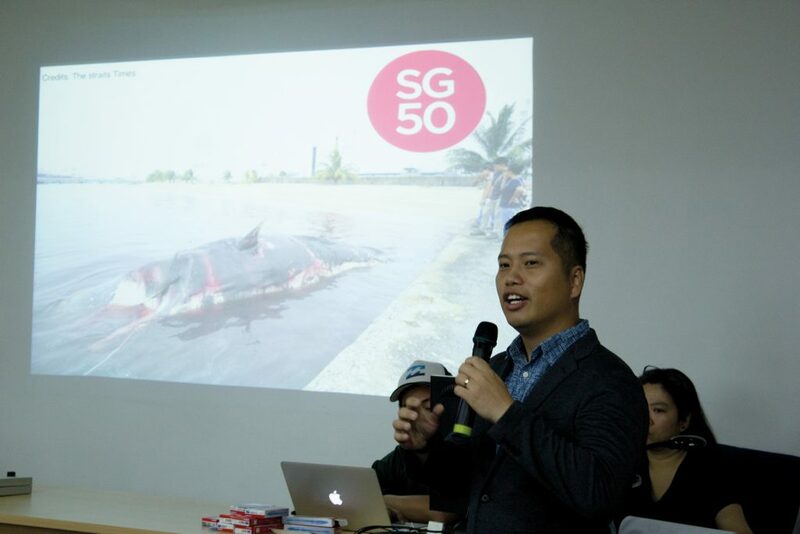 As this year’s Guest of Honour, Mr Leong gave the closing address about his work in environmental education – working on projects with youths in the community. The Hot Soup School Challenge second runners-up: Loo Guan Hin, Quek Chui Qing, Galen Lee, Brian Siew. Mr Leong presented the trophies and medals to the top three teams, and certificates to all the participants, who had the opportunity to have a group photo with him before fetching their goodie bags, which included TAT tote bags and accessories, complimentary laser tag tickets from Tag Teams, B2P gel pens from Pilot, and a bottle and voucher from the People’s Association (PA) Water Venture. Guest of Honour Mr Leong Kwok Peng. We’d like to thank the schools, sponsors, speakers and organisations that came together to support the event – and a big shout-out goes to all the participants who showed what team spirit is all about. We look forward to seeing teams return to test their knowledge of Asia at the seventh Hot Soup Challenge on July 7, 2018.